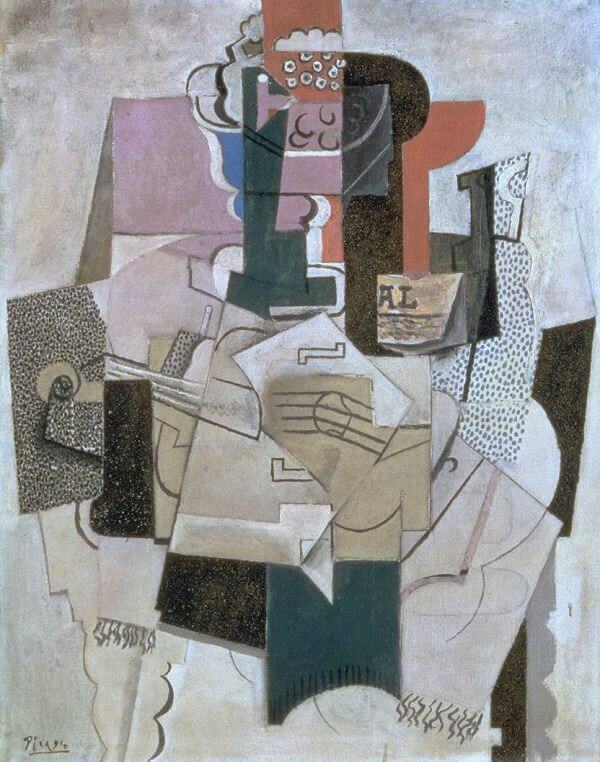 Violin and Bottle is typical of his Synthetic Cubism, in which he uses various means - painted dots, silhouettes, grains of sand - to allude to the depicted objects. This combination of painting and mixed media is an example of the way Picasso "synthesized" color and texture - synthesizing new wholes after mentally dissecting the objects at hand. During his Analytic Cubist phase Picasso had suppressed color, so as to concentrate more on the forms and volumes of the objects, and this rationale also no doubt guided his preference for still life throughout this phase. The life of the cafe certainly summed up modern Parisian life for the artists - it was where he spent a good deal of time talking with other artists - but the simple array of objects also ensured that questions of symbolism and allusion might be kept under control.